This Poker Deal is one that I have successfully used for many years to impress someone special. 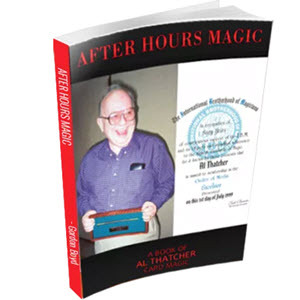 Upon first reading, it may not seem like much to an advanced cardman, but the placing of the cards in the spectator's hands to do the dealing and his calling the winning hand is what makes the effect worth doing. I remember three or four years ago, Kenny Rogers came into Lilly Langtry's for dinner, and it was my pleasure to entertain him with a selection of card effects. I included this Poker Deal. 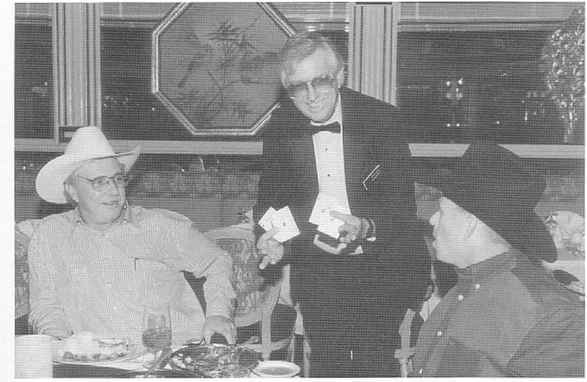 When I finished my show, Kenny said: "Mike, I am having a party at my home in California next month and I would like you to perform some of your card magic, but you must perform that Poker Deal. My friends will love it!" Have a Royal Flush in Spades on top of the deck. 1 suggest that you do not have them in order from Ten to Ace. That would make the revelation a little too 'pat.' Besides, if you are going to "cull" the Royal Flush to the top during other effects, it is easier to "cull" them as you come to them, rather than trying to put them in order. described in "The Expert at the Card Table" by S. W. Erdnase, pages 83, 84 p and 85. It is called "Top Palm. First h Method." I feel that 90% of those persons who buy this book will also have 4 Erdnase in their possession. The other 10% should buy it as soon as possible. For a photo look at the sleight, see Photos 1, 2 and 3. 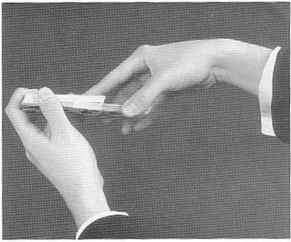 The 'palm' is performed as you say: "Are there any Poker players at the table?" Whether they say yes or no is not really important. The question gives you misdirection to make the palm. 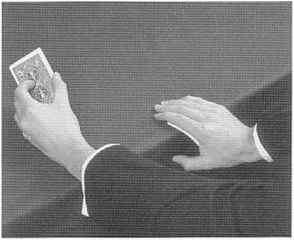 p li If there is a Poker player at the o table, extend your left hand, which is holding the deck, to the spectator and ask him to cut off 1/2 of the deck and .5 shuffle it. Hand the remaining 1/2 of the deck to another spectator. 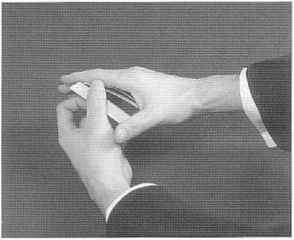 As you extend your left hand, bring your right hand back to the edge of the table. 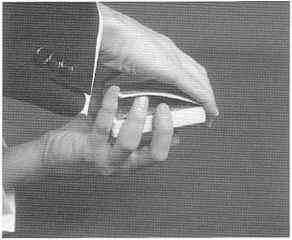 (See Photo 4) Rest your hand in this position while the deck is being shuffled. This position will effectively conceal the palmed cards. As you perform this action, say to the spectators: "Do you mind if I give the decka little shuffle? lust to keep you honest. Not that 1 don't trust you!" These remarks will give you added misdirection to replace the five palmed cards. You are now going to perform a Far around 1961. Later, Dr. James Nuzzo published his version in the "New Tops" magazine. Now hold the cards in Faro Shuffle position again. This time cut off a little less than 1/2 of the deck with your right hand and perform the very same "Faro Slough Off" that you did a moment ago. At the completion of this special shuffle, your Royal Flush is set to fall to the third hand in a four handed game of Poker. Place the Faroed sections of the deck on top of the packet in your left hand and push the packets flush, thus squaring up the deck. The Royal Flush is now alternated every other card starting with the top card of the deck. 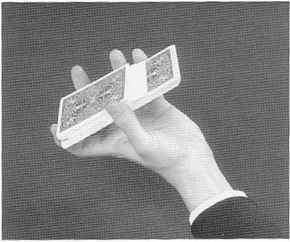 Now perform an overhand shuffle as follows: Undercut 1/2 of the deck, run one card, in jog the next card and shuffle off. 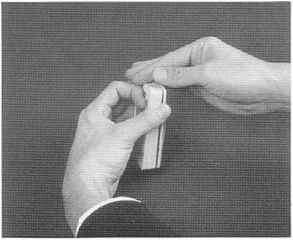 Form a break at the in jogged card with your right thumb and shuffle off to the break. Throw the remaining portion on top. What this shuffle does, as well as further mixing the can your stack is alternated every other cc s, is add one card on-top of your stack, rd starting with the second card. While you are holding the cards ask a spectator to name one of the four hands in a game of Poker. If he names the third hand, and he usually will most of the time, you do nothing; you are already set. If he names the fourth hand, either side-steal the bottom card to the top or double cut one card from the bottom of the pack to the top. If he names the second hand, double cut one card from the top to the bottom or slip-cut one card from the top to the center. If he names the first hand, double cut two cards from the top of pack to the bottom. As you cut the cards say: "We always follow a shuffle with a cut!" Wink at the spectator as you say this, and smile. Now say, "If I deal the cards, you may accuse me of cheating so I will let you deal." Have the spectator take the pack and let him deal four hands of Poker, five cards to a hand, face down. Take out your wallet and drop it on the chosen hand saying: "I'll bet on diis hand!" Turn the other three hands face up, one at a time, and make any appropriate remarks regarding die strength or weakness of the hands. Sometimes a strong hand will show up and you will get credit for causing it to happen. Now pick up your wallet off the chosen hand and let the spectator turn the cards face up, one at a time, to reveal the Royal Flush. Finish by saying, "Boy, I'd hate to play cards with you!"